Our July law firm strategy question of the month focused on the characteristics that comprise a “model partner.” While crafting the balance of behaviors and traits of an ideal partner is a bit more fun (and bit less strategic) than previous months’ questions, the results (and the thought process) are useful. In particular, in an era of increased partner mobility and a tighter reign on entry into partnerships, it is very important to understand what your firm expects and needs from its partners (or at least its hypothetical “model partners”). As some were quick to note in the open-ended comments section, few partners are actually a perfect balance of the positive characteristics highlighted in the survey question. In the real world, partners’ individual strengths and limitations tend to balance each other out across the firm. Thus, some are much stronger business originators, while others are extraordinarily creative lawyers and problem solvers. Some are exceptional relationship managers and some are truly gifted in their ability to bring people together and to develop the talents of their peers and subordinates. 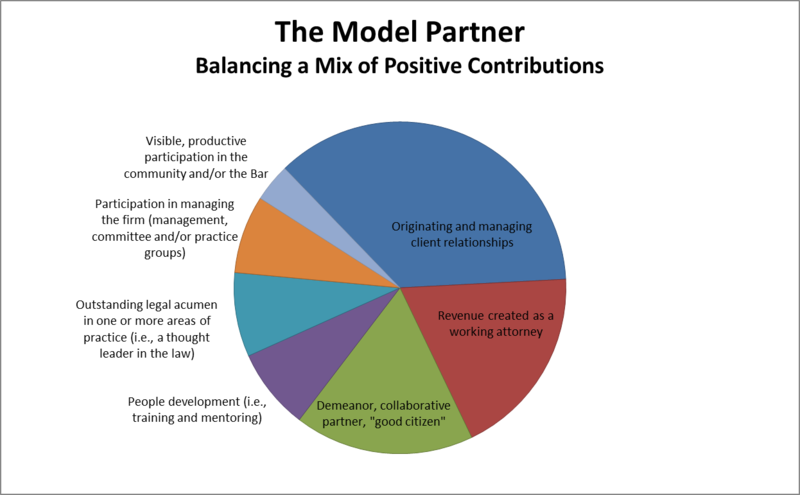 The “model partner” question was structured as an exercise in balance. Survey participants divided 100 points across a range of positive characteristics good partners exhibit. Thus, the overall result produces a pie chart that visually depicts the “ideal” balance of positive traits we want in our partners. Note that in the pie chart, we have grouped multiple characteristics into larger themes (for instance, training, professional development and mentoring were grouped together into people development). The idea of balancing a range of positive characteristics is undoubtedly the most productive way to think about what constitutes a “model partner.” But, the characteristics can also be view through the prism of a simple list as well. In that context, business origination was clearly the most important characteristic (over one-third of the aggregate weighting was given to origination). 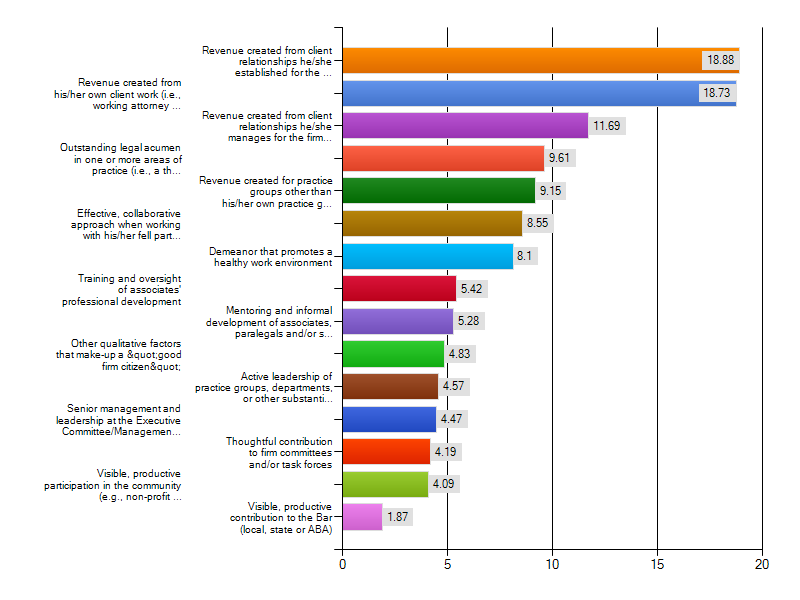 Working attorney receipts and the set of qualitative factors that make-up a “good citizen” of the firm were roughly tied as the second most important factors (both slightly under 20% of the weighting). People development, outstanding legal acumen, and participation in the management of the firm each received slightly less than 10% of the weighting. In addition, a number of other terms offered in the open-ended response help to define some of the more qualitative aspects of good partners including loyalty, integrity, responsiveness, self-directed, and “servant leadership” (a term coined by Robert Greenleaf in a 1970 essay). Finally, for those who completed the full survey exercise and are interested in the detailed responses, you will find those in the chart below. Note that the weightings do not add to 100 in this chart, since they represent average weightings regardless of the number of responses given to that characteristic. In that sense, it gives added weight to the lower rated items (which were given de facto ‘zeros’ by some respondents). As always, we welcome your comments below or off-line via email at jsterling@sterlingstrat.com. Thank you for reading and for participating in the July 2012 strategy question of the month.